This is a very easy Indo Chinese recipe prepared with vegetables, noodles and schezwan sauce or chutney. 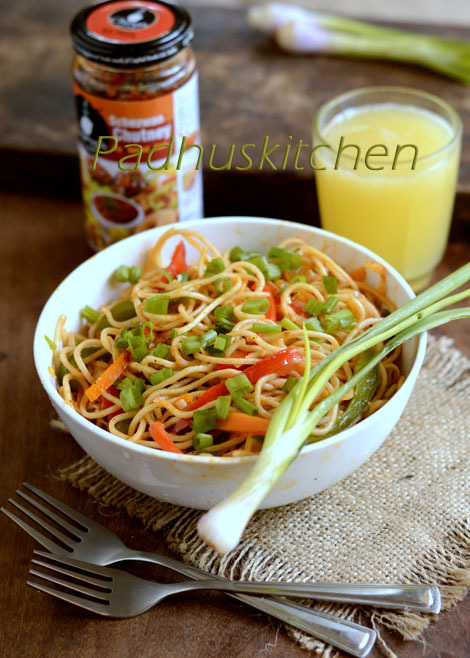 If you have schezwan sauce or chutney with you, preparing stir fry Schezwan noodles is a breeze. Today we will learn how to make Schezwan Veg Noodles following this easy recipe. Bring 8-9 cups of water to rolling boil. Add hakka noodles and cook for 2 minutes. Do not overcook the noodles. Drain the water completely and pour cold water on the noodles. Drain and then spread it on a plate. Toss 2 tsp of oil on the noodles. This is done to prevent the noodles from sticking to each other. Finely chop onion, garlic and spring onion greens. Cut cabbage, capsicum and carrot into thin strips. Heat oil, add finely chopped onions and garlic. Saute until onions turn pink. Add carrots and saute on high heat of 4-5 seconds. Add cabbage, spring onion greens, saute for 3-4 seconds and then add capsicum. The whole process has to be done on high flame. The vegetables should retain their crispiness, so take care not to overcook the vegetables. Add 2 tsps of Ching's Secret Schezwan Chutney, salt needed and saute for another 2 minutes. Reduce the flame, add the cooked noodles and toss until it is well coated with the sauce. Add pepper powder to taste. * This is not a paid review. I wrote it out of my own interest as I like Ching's Secret Schezwan Chutney and hakka noodles. None will say no to that bowl of droolworthy noodles..
Makes me hungry, delicious n tempting noodles.. This will surely occupy in our Breakfast Menu, twice weekly. Thanks Madam.